I have already made a formal review of Ben-Hur as part of both The Essentials and the Best Picture Retrospective. This instead will be some personal observations on watching Ben-Hur at the Plaza Classic Film Festival. There is something extraordinary about watching such a monumental picture like Ben-Hur on the really big screen, the way it was originally presented. Even on a wide-screen television, something is indeed lost in translation, and one of the things I found extraordinary about Ben-Hur is that while watching I could appreciate so much that I had missed. Chief among them is the detail to which William Wyler used the mass canvas to which to make, as he put it, his version of a Cecil B. DeMille picture. It was only at the beginning when I noticed that there was so much going on at the sides of the film. The mass chaos of Jerusalem as Joseph and Mary head to Bethlehem features so many people working, moving, being within the scene. Again and again we see how Wyler did not keep things focused squarely in the middle of the screen. Instead, Ben-Hur captures so much within the frame. When Balthazar meets Judah and Esther before Christ gave The Sermon on the Mount, on the large screen we can see the multitudes coming to the mountain, and can appreciate how much thought and planning went into the production. There were epics before Ben-Hur and Biblical ones too (DeMille's The Ten Commandments immediately springs to mind) but instead of just filling the screen, Wyler gave it all a greater purpose: to fill the picture with life, with energy, and with humanity. Take for example when the Magi enter the stable. They are surrounded by all types of shepherds, but it is a credit to Wyler and composer Miklos Rozsa that within this massive picture on an grand scale, we can have such a tender and intimate moment. Speaking of Rozsa, one of the great things within Ben-Hur is the score. Unlike today where A.) overtures no longer occur before feature films, and B.) we can speed through them when playing films on DVD, when one listens to the overture to Ben-Hur, we appreciate again what an extraordinary and brilliant score it is. We have the grandness of the film, but also the gentle, intimate music that serves to dramatize the love story between Judah and Esther. Hearing all the themes of Ben-Hur, in the dark stillness of the theater save for the twinkling lights that make the ceiling appear as stars, there is an enchantment that overwhelms you with its beauty. The setting of the Plaza Theater (with its 'stars' blinking above you) and Miklos Rozsa's music put together is a beautiful thing, one that brings magic to the film-going experience. It is in a way a bit of a time capsule, giving us as close as possible what someone watching Ben-Hur for the first time probably experienced. Here I will speak about something that is still breathtaking in Ben-Hur (especially on the large screen): the legendary chariot race. This film is almost 55 years old, with no special effects unlike those of The Lord of the Rings: The Return of the King and Titanic (the only films to equal Ben-Hur's record-setting 11 Oscar wins). However, the chariot race still caused audible gasps, especially whenever another rider was forced off his chariot and appeared to be rolled over. I confess to being a bit surprised by the audience's reaction. Perhaps it is because I knew what was coming, and because I knew it was done with dummies and brilliant editing. However, it is to the power of Ben-Hur that the visuals are still so strong that it all looks so real. This should be a lesson to those who drown their films in special effects: sometimes the best special effect is the one that serves the story, not the one that draws attention to itself. Speaking of John Dunning and Ralph Winter's editing, we can see how brilliant it is in the rowing sequence, when Jack Hawkins' Quintus Arrius calls out for "ramming speed." The score serves to heighten the tension, but the editing makes things go faster, more frantic and intense. Here I appreciated just how flawlessly the editing was. This scene was a major one, but there are also little moments, such as when the shofar announcing the birth of Christ fades to then have a trumpet beginning the opening theme to Ben-Hur...another brilliant moment. Finally, I reflect on something story-wise that only now, at this particular viewing, caught my attention as to how brilliant Wyler was. It is after Judah has won the chariot race (when we have music returning after having nothing but the roar of the crowd and the chariots provide the soundtrack to the legendary scene). Pontius Pilate (Frank Thring) calls Judah to the stage. Here, Pilate crowns what he calls the crowd's "one true God" with a crown of laurels to the cheers of the mob. Only now do I notice the juxtaposition to history, where a short time later Pilate would be handling another Jew who was seen as "the one true God" where He wears a crown of thorns. This sequence is not by any means a parody of the Trial of Christ, but it is to reflect the parallel lives of Judah and Jesus, both Jews who kept to their faith despite great Roman opposition but who took different routes: Judah through a quest for revenge and (empty) triumph at the chariot race, Jesus through a quest to redeem the world and a triumph at the Cross. One need not be a Believer to appreciate the craftsmanship and visual splendor/spectacle of Ben-Hur. In fact, the Christian aspect within Ben-Hur is not the central point of the film (despite its subtitle of A Tale of the Christ), but it was highly respectful of the Christian tradition. Wyler once quipped that it took a Jew to make a good movie about Jesus, and while I would say Ben-Hur ISN'T about Christ per se it certainly is a film that shows appropriate reverence towards Jesus of Nazareth while also appealing to those who either are non-Christians or non-religious. Still, one cannot help be impressed with the intelligence within Ben-Hur, which is one of the many reasons why it still has an extraordinary power. You have extraordinary performances from the cast: Charlton Heston as the larger-than-life but still human Judah Ben-Hur, a man refusing to betray his people or identity, Haya Harareet as Esther, the woman who loves him but knows the road he is taking is a dark one, Hugh Griffith as the bon vivant Sheik Ilderim, Hawkins as the wise and loving father figure to Judah. You have visual splendor and spectacle, an extraordinary score, but above all else, you have a highly intelligent story that respects the faith of people while also keeping things moving and entertaining. The screening at the Plaza Classic Film Festival had some problems. Near the end of Part I the sync was a bit off. It wasn't too bad at the beginning but near the end it was becoming far too noticeable: Judah would leave his mark with his ring on wood and then a few seconds later you'd hear the ring strike the wood. At the beginning of Part II the picture was out-of-focus, much to the audience's irritation. At first the efforts to fix it made things worse, and the audience let them know. Once it was fixed however, their efforts were met with enthusiastic applause. It seems that every year I see a previously-seen film at the Plaza Classic Film Festival that I appreciate more at its screening. This year, it was Ben-Hur, and the minor technical difficulties didn't bother me. One should always take an opportunity to see a film of that scope on the big screen if possible. However, I couldn't help think of The Simpsons parody, A Burns For All Seasons (whose title is a spoof of A Man For All Seasons) while watching Christ offer Judah water. That's how ingrained Ben-Hur is. It is an extraordinary picture, and the Plaza Theater is an extraordinary venue with which to enjoy this epic film. 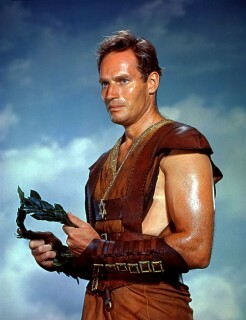 Ben-Hur is also one of my favorites. That Chariot race scene contains some of the best early stunt work that I have ever seen. I also consider it to be one of the few films with Christian themes to actually not be a complete cheese fest like most modern attempts.